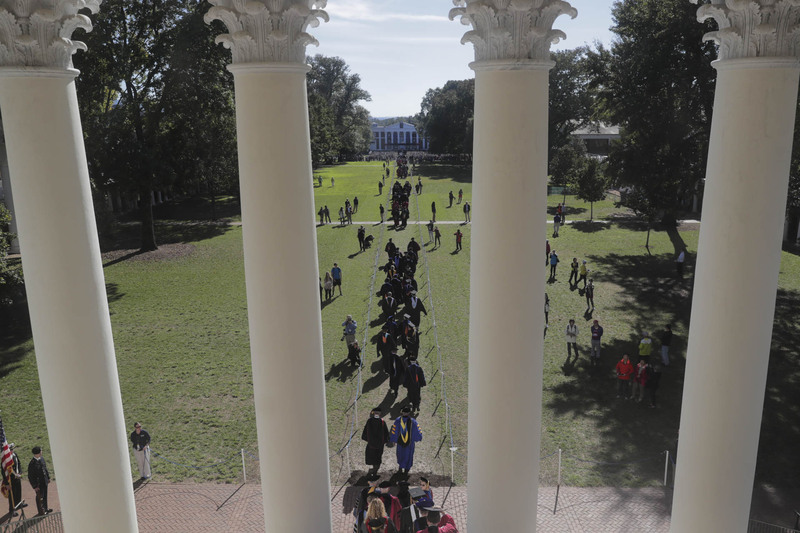 Friday was a special day at the University of Virginia. 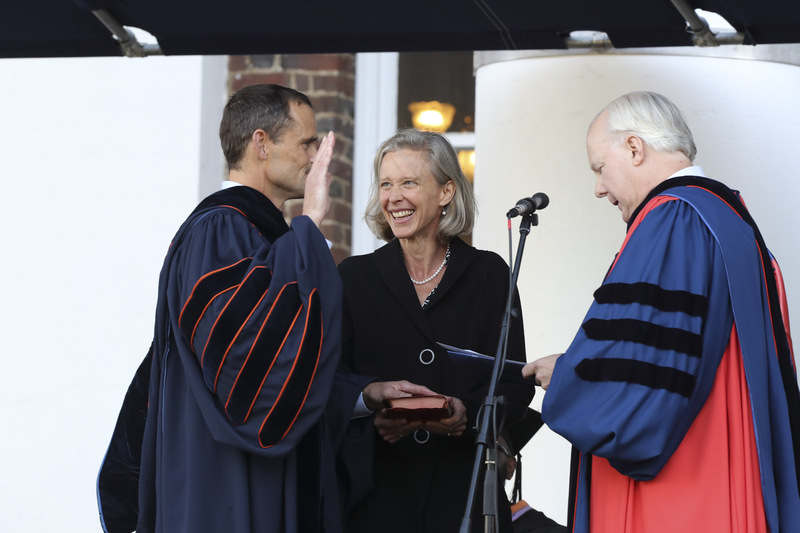 It was an important day for the University, as Jim Ryan, like only eight others before him in UVA’s 200-year history, raised his right hand, took the oath of office and officially became president of the University. 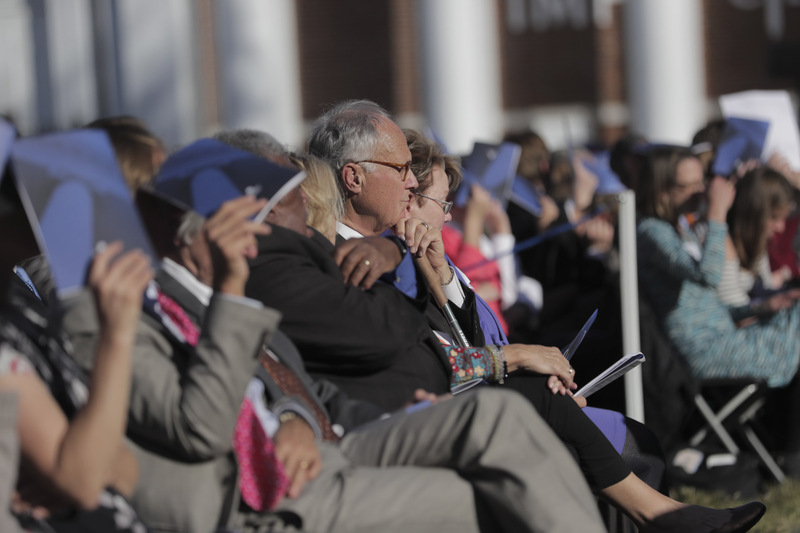 It was a memorable day for the students, faculty, administrators and community members on hand to witness the occasion, savoring both a sunny fall day on the Lawn and a slice of history. And it was an especially meaningful day for Ryan, both personally and professionally. He officially assumed the helm of the University where he earned his law degree and served as a beloved law professor for 15 years. And he did so in front of his wife, Katie, and their four children – Will, Sam, Ben and Phebe – and both his birth and adoptive families, who met for the first time over the weekend. Beginning at 3 p.m., Ryan joined scores of deans, faculty members, students and representatives from more than 100 colleges and universities attired in full academic regalia. The colorful procession streamed over the Rotunda steps and down the Lawn to applause from the large crowd gathered to witness the inauguration. Among the crowd was alumna Kathy Boase, who works at the Law School Foundation and remembered Ryan from his days as a law professor. She said she was looking forward to seeing him in his new role. “I didn’t want to miss an occasion to celebrate a colleague as he becomes president of this university,” Boase said. Charlottesville resident Chuck Bruce came to witness a significant event in local history. 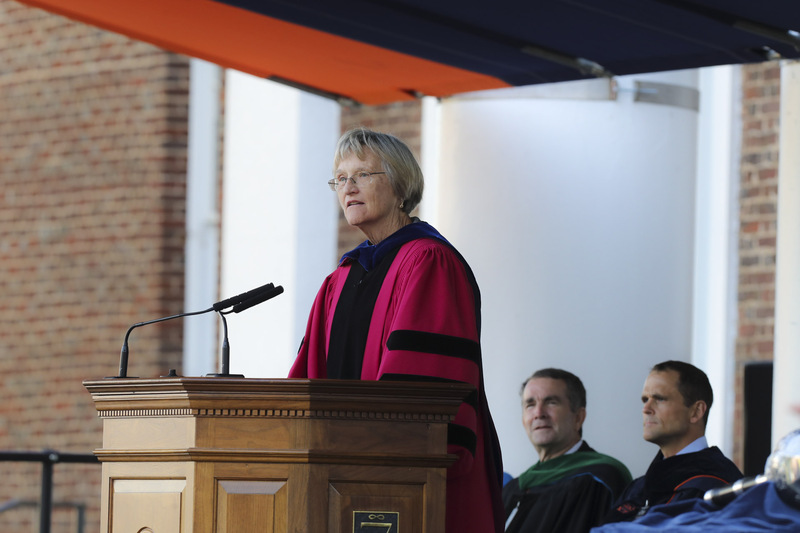 “I think it is important to observe and honor the president of the University of Virginia, which we know as a prestigious institution,” Bruce said from his seat on the Lawn, near where he sat to watch his son graduate from UVA in 2017. The ceremony, which took place on the steps of Old Cabell Hall, began with the national anthem, performed by the University Singers. After a welcome address from School of Nursing Dean Dorrie K. Fontaine, who will step down as dean at the end of the year, and an introduction from Donna Price Henry, chancellor of the UVA College at Wise, Virginia Gov. Ralph Northam stepped up to the podium. Northam noted that, just over 200 years ago, three U.S. presidents – Thomas Jefferson, James Madison and James Monroe – gathered to lay the cornerstone of the University near Pavilion VII. 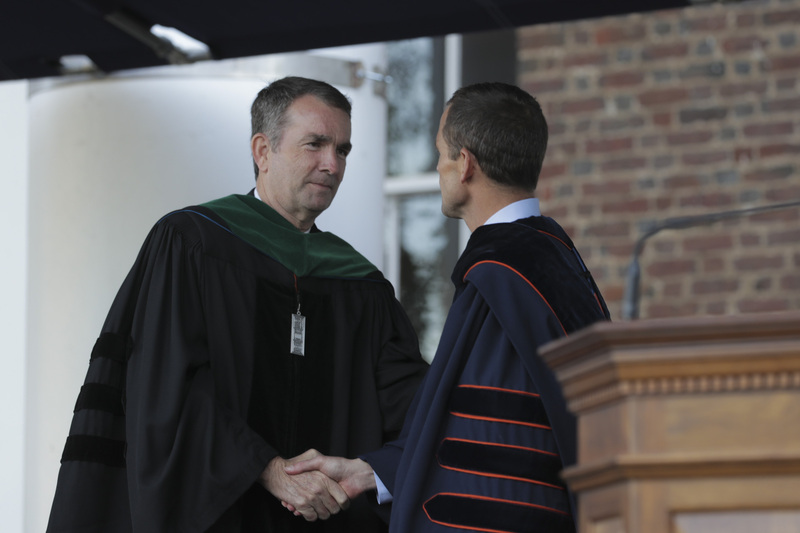 “The legacy of scholarship begun then now reaches beyond these Grounds to southwest Virginia and UVA Wise and beyond the borders of our commonwealth, across oceans, crossing barriers of language, culture and natural and political borders all over the world,” Northam said. The governor praised Ryan’s research on how law and policy affect educational opportunity and expressed confidence in his ability as a leader. “As President Ryan takes the reins as the University’s ninth president, I am confident that he has the ability, the experience as well as the intellectual curiosity to serve this university well and lead it into the 21st century,” Northam said. After Faust spoke, Ryan himself rose and raised his right hand to take the oath of office, laying his left on a Bible held by his wife, Katie. UVA Rector Frank M. “Rusty” Conner III administered the oath. Looking Conner in the eye, Ryan swore to support the constitutions of the United States and the Commonwealth of Virginia and “faithfully and impartially” discharge his duties as UVA’s president, drawing a standing ovation from the crowd. With that, the new president stepped up to the podium to deliver his inaugural address, “Faith in the Unfinished Project,” laying out his hopes and plans for the University. A successful university, Ryan said, requires a certain kind of faith – faith that research will lead to progress not currently possible; faith that work students do today will help them become wise leaders tomorrow; faith that faculty and staff members can use their work here to make an impact and change the world. “This is the grand faith of universities and those who participate in them: faith in the possibility of progress,” Ryan said. “Progress toward a more prosperous, healthier, just and peaceful society, and progress toward lives that are more meaningful, purposeful and passionate. Such faith, Ryan said, demands both an honest assessment of the past and the present and a bold, hopeful vision of the future. As the University enter its third century, Ryan said, he sees a community that will strive to live out its values, to embrace diverse points of view, and to promote sustainability, social justice, free speech and academic freedom. Ryan, a first-generation college student who attended Yale University and UVA’s School of Law on scholarship, also wants UVA to be known as one of the best universities in the world for first-generation and low- and middle-income students. He promised an ongoing commitment that Virginia families earning less than $80,000 a year, with typical assets, will be able to send their children to UVA tuition-free, and that the University will cover tuition, room and board for students from Virginia families earning less than $30,000. The promise drew cheers from those assembled on the Lawn. The University currently provides a broad range of financial support for families with demonstrated need, but Ryan’s remarks represent the first promise that the approach for Virginia families at those income thresholds is now a formal University commitment. 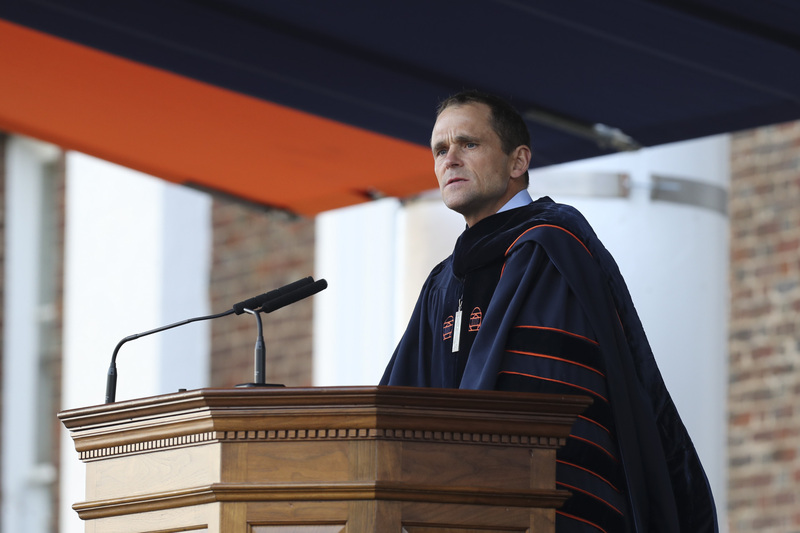 Ryan laid out several other highlights in his vision for UVA’s future, from growing “a faculty as diverse as it is outstanding,” to using interdisciplinary research to tackle the world’s most pressing challenging and preparing students for a life of purpose and service. Ryan acknowledged the world will be watching as UVA works to achieve this vision. Achieving that progress, he said, will require hard work and faith on the part of those on Grounds and well beyond.